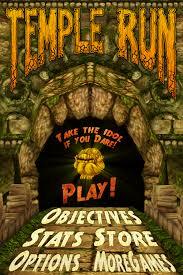 Home / Gaming / Temple Run Tricks / Temple Run Tricks: So Why are You Running? Temple Run Tricks: So Why are You Running? Everyone’s running at Temple Run. So why are you running? Let’s not talk about the theoretical reasons behind playing Temple Run like personal entertainment, relaxation purposes, ease boredom, or simply letting time pass by. These are already given. What I wanted to know is why are running for the Temple Run game? As for me, I run for distance. I’d like to challenge myself and see how far I can reach in terms of distance. I haven’t even accomplished the half a million points mark yet but I’m almost there. (Actually done with one million just recently). What can you run for? Aside from distance, you can also run to accumulate points. Earning points is not my objective so I don’t really collect coins along the way unless the character will pass by areas with coins already present. Also, I simply acquire the magnet bonus when it’s offered so it’s more fun and easy to collect coins. The magnet simply picks up the coins without the need for you to tilt either way to gather them. So one of the Temple Run tricks you can apply is to take advantage of the magnet whenever it’s available. Although I don’t regard coins with much weight, they are actually vital to the game. In fact, the total points generated get multiplied with the accumulation of coins. So if you can train yourself to amass coins while running perfectly, then it will benefit your goal to boost points if gaining points is your objective for running in Temple Run. That’s also one of the Temple Run tricks you can make the most of. Still in relation to coins as one of the vital Temple Run tricks, you can be able to purchase upgrades including the magnet, invisibility, mega coin, coin values, and resurrect. The latter can only used once though. Invisibility isn’t really that much of a help. Most of the time I find it even distracting as the blue webs it creates to highlight challenges makes it difficult to calculate the perfect distance for you to jump or slide. I mentioned earlier that magnet is really beneficial and so are the other coin related upgrades. Mega coin is a bonus which is presented randomly while you run. Get it and you’ll generate bonus coins. Coin values upgrade on the other hand simply increases a coin’s worth as the distance you run also adds up. Yellow colored coins are the basic ones, red is more valuable, and blue is of the highest rate. There are practical Temple Run tricks you can apply to make the whole experience easier. After wiping the touch screen with a soft cloth and washing my hands, it becomes less difficult for me to navigate the display. I can easily steer the character on all directions. You can try it too and see if it works for you. Practicing regularly is also one of the Temple Run tricks you can apply. Not to the point that it takes too much of your time or that you become addicted with it, but at least practice to become more familiar with the game. As you constantly play, you’ll realize that most of the hurdles are actually similar so you’d get used to each twist and turn through frequent play. You will be able to anticipate each curve, tree, and gaps between the temple routes. Thus, your movements will become natural and you won’t have to force a reaction. You would have an automatic response for every situation. Your hand and eye coordination will be remarkably improved too. As with any other game, mastery is learned by disciplined; the same applies to Temple Run. This game by the way is only available in Apple devices such as the iPad, iPhone, and iPod touch. It is not sold in any other operating system. In Android, it is available only at limited types of devices (really high end Android phones let me say). So for you Temple Run runner, why are you running?